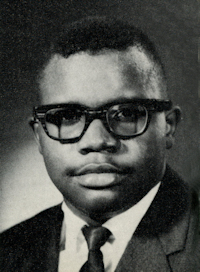 Obituary – Jenkins, James Isaac « Perry High School Alumni Association, Inc.
﻿Home Room Pres. 62-63, Band Treas. 62-65, Stage Band 63-65, Jr. Play 63-64, Home Room Treas. 64-65, Football 63-65, Track 63-64, F. T. A. 64-65, All School Revue 63-65, Letterman 64-65. James Isaac Jenkins, 46, Midwest City, formerly of Perry, died Wednesday, Jan. 19,1994, at the Veterans Administration hospital in Oklahoma City, where he had been a patient since Monday, Jan. 17. Funeral will be at 2 p.m. Tuesday at the Church of God in Christ at Perry with Rev. J. S. Greer, pastor, officiating. Burial will be at Grace Hill cemetery at Perry under direction of Temple & Son Funeral home of Oklahoma City. Jenkins was born in Perry and was a graduate of Perry high school. He served in the United States Air Force, attended Oscar Rose college in Midwest City and furthered his education at the University of Oklahoma at Norman. He was employed 10 years at Tinker Air Force Base in Midwest City. Jenkins is survived by his wife, Choe, and two daughters,Aundrea and Lisa, all of the home; his mother, Mary Belle Adkins, Perry; three brothers, Raymond Adkins and Napoleon Adkins, both of Perry, and Robert Irving Adkins, Lake Tahoe, Nevada; and a brother-in-law, Leo Caine, Perry. Preceding Jenkins in death were his father, Frank Adkins Sr.; one brother, Frank Adkins; and one sister, Ethel Mae Caine.